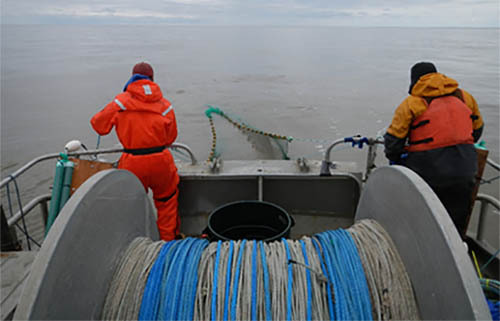 Retrieving the net from the Yukon River onboard the chartered fishing vessel Anchor Point. Photo NOAA Fisheries. Yukon River Chinook salmon (Oncorhynchus tshawytscha) are an important subsistence, commercial, and recreational resource. With runs once numbering close to 300,000 adults per year, these fatty fish were once the mainstay of subsistence communities and commercial fisheries all along the river. However, since the late 1990s, Chinook salmon returns have been in a period of prolonged decline with far fewer fish returning to the river to spawn. To help restore stocks, managers implemented measures to control Chinook salmon harvest. Commercial and sport fisheries were closed and subsistence fishing has been severely restricted in recent years. As a result, many of the hundreds of fish camps that once lined the Yukon River have disappeared or been abandoned. These restrictions have severely impacted and continue to impact communities located from the river mouth to the headwaters in Canada by eliminating access to the Chinook salmon resource that people have traditionally and historically relied on for their lives and livelihoods. The causes of the Yukon River Chinook population declines and fluctuations are not known, but there is strong evidence that the early marine period, when the salmon transition from freshwater to the marine environment, represents a critical stage in juvenile salmon survival. Yukon River Chinook salmon are categorized as “stream-type Chinook” which spend one or two winters in freshwater before migrating to estuaries and eventually to the sea. During the early marine period, the fish must feed and grow to obtain sufficient size and store energy in preparation for their first winter at sea. There is evidence that the juvenile salmon need to reach a minimum size by the end of their first summer at sea in order to have good probability of avoiding predation and surviving the winter. This size-selective mortality suggests that the way the juvenile fish use their habitat, the abundance and quality of food, and the number of predators may all be very important in determining whether the fish grow to become adults to return to the river and spawn. Another factor potentially affecting juvenile salmon survival is the match/mismatch between outmigration timing and available prey resources in the early marine life. Statistical models of outmigrating juvenile Chinook salmon dynamics have found a correlation between the timing of ice breakup at Dawson, Yukon Territories, in the year that smolts migrate to sea and the peak migration of fish leaving the river. If prey abundance matches the timing of outmigration, the juvenile fish will be larger and healthier when they reach the marine environment. Understanding the interplay of growth, outmigration timing, size, diet, and condition of juvenile Chinook salmon throughout early marine rearing habitats is, therefore, integral to addressing the role of early marine processes in structuring cohort strength of Yukon River stocks. In collaboration with the Alaska Department of Fish and Game and the Yukon Delta Fisheries Development Association, and with financial support from the Arctic-Yukon-Kuskokwim Sustainable Salmon Imitative and the North Pacific Research Board, NOAA Fisheries scientists at the Alaska Fisheries Science Center initiated a study in 2014 to characterize habitat usage, size, diet, marine entry timing, and condition of juvenile Chinook salmon in the Yukon River Delta. Prior to this research, the only information on lower Yukon River Chinook salmon came from a single study of the southern tributary conducted in 1986. By combining net sampling methods in nearshore (tributary and tidal channel) and offshore (delta front and pro-delta) locations with oceanographic measurements, we hope to shed light on the complex processes affecting early juvenile Chinook salmon survival.